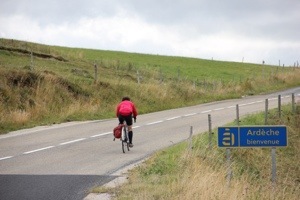 On Sunday 8th September the group left St-Paulien for elevenses in Le-Puy-en-Velay and then began a series of steady climbs to Coubon, near the source of the Loire, and to Le Monastief for lunch. More climbing took them over the boundary between Auvergne and Rhone-Alps and into the Ardèche for an afternoon break at Le Beage. Then along beside lakes and reservoirs to our hotel at St-Cirgues-en-Montagne. Just time for a personal ride upto the Atlantic-Mediterranean watershed before dinner.